* Special Thanks to Phil Day for the set list! * Thanks to Anke and Jorg for the set list! Top photo: Donna (left), Michael Ball and Val (right) in the audience; Bottom photo: John Lithgow in the audience 25 July! Val (left) and Donna (right). Wednesday saw the closing night of Barbra's European Tour and boy did she go out with a bang!!! She was in excellent form and voice—she really went for the belter notes and hit them EVERY time!!! The audience adored her and rightfully so! Since last November, I've been fortunate enough to see Barbra perform live on 3 occasions in 3 different countries and I've got to tell you — there are just not enough adjectives to accurately describe her amazing talent. I've said it before but her performances are mesmerising—she makes each one feel fresh, funny and as if she's doing it just for you (each and every time!!!). She's wonderful, a living legend and in an age of throw-away celebrity—she is a TRUE star!!! If I had the chance to see her perform again —would I? Absolutely—I'd do it in a heartbeat!!! 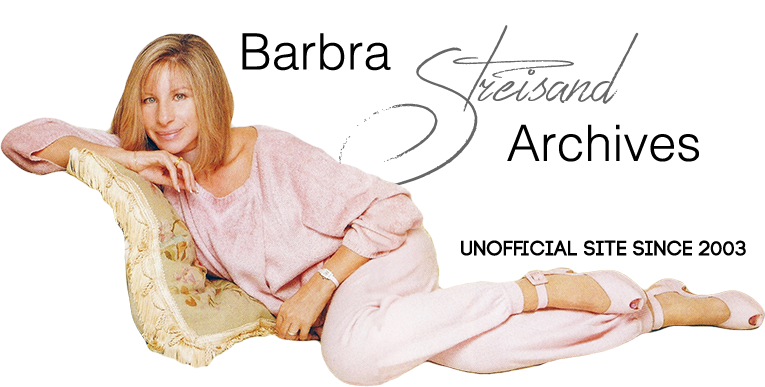 I saw Barbra Streisand perform on the 18th also, but this evening I felt curiously elated as she took to the stage a mere fifteen minutes late. Could she top the powerhouse performance she'd already given on her opening night? Well, she could, and boy, she did! From the opening notes I realised I was in for a treat. Any first night nerves had gone, as had the slightly smoky quality to her voice. The voice tonight was as clear as a bell. Her high notes flawless, her low notes resonant, those pure notes that seem to get into you head strong and unwavering. And she knew it too. That Stradivarius of a voice was working wonderfully and she was loving it! She varied her opening night programme only slightly. Playing the piano for 'Ma Premiere Chanson' Barbra lapsed into a story about an opening act at The Bon Soir, but couldn't remember who it was. "Anyway, she used to say 'Princess Mar-gar-et!' she laughed, but realising the story was going no-where she giggled and said, "It was funny at the time!" Truly remarkable, Barbra. A wonderful night. And smile I did. I first caught sight of Barbra in the early 70s when I was about 10, when my parents took me to see What's Up Doc in Newcastle, Australia and she touched my soul. Her voice touched me in so many ways that she can't even imagine. I thought it was to be a once in a lifetime experience to see her in Sydney in March 2000. I had never experienced walking away from something with a crowd of similarly smiling and contented people. Who would have thought that this once in a lifetime experience could hit twice? We moved to the UK at the end of 2000 and when I found out that Barbra would be playing in London, I said to my wife "I want us to both go this time". I had to go to a funeral in Cornwall the day the tickets went on sale so had to leave my wife to buy the tickets. I had a call from her as I was driving down saying that she had decided not to buy us two £200 tickets, but had instead got me a £500 near the front. So what was it like lightening striking twice? I got to the Millennium Dome on the Jubilee Line on the Tube. You could see who was just going home after work or on their way to a night shift somewhere... and who were going to see Barbra. It was like Richard Dreyfuss in Close Encounters sculpting mashed potato—you could spot the likeminded spirits. Just before Barbra came on, a woman behind me said "I wish the people in front would sit down". I wanted to tell her that we would be all on our feet when Barbra appeared; and so we were. Words cannot describe the emotion of the first moments of Barbra onstage. In 2007, she seems more comfortable with herself and with the audience, but this time a little careful of her voice at first. When she spoke, she was a little hoarse. However, she became more confident throughout the show with many a spine-tingling moment. The audience willed her on and on to produce that Barbra magic. She saved the best until last when as an encore, Barbra sang Don't Rain On My Parade in such a way that it brought the house down. After a further absence from the stage and rapturous applause from the audience, Barbra reappeared to sing Smile. Then after a long absence and much applause and foot stamping, Barbra again took the stage - this time to sing I Dreamed Of You to her husband for his birthday. This song means so much to my wife and I; we played it when we had our civil marriage blessed in 2003. How could I ever forget you once you had touched my soul - never my Barbra. You may not know me, but you are always with me. Thank You. She connected well with her 21,000 or so fans (it wasn't a sell out) that made her do 3 encores. I know that the first two were planned but she was encouraged to come back for a third one and her conductor had to scramble to talk to her about what she was going to do. It was her husbands birthday and she sang for her final encore song the song she sang for him at their wedding. Her voice was a little shaky on a couple of notes as she nears the end of her tour, but Streisand at the O2 was just one memorable night! She looked fab, she sang for over 2 hours in a set which covered her entire career and featured showtunes, jazz and of course a little comedy. But what really defined this show and just blew me away was how she managed to make a stadium concert in front of 20k people feel intimate, impromptu and personal. She connected with the audience and took time to respond to each and every shouted message of adoration, something which the likes of Madonna could really learn from, based on her last show. Streisand owned the room and, yes it was expensive and yes the seats were so far from (and high above) the stage that folks around us were suffering vertigo, but when she sang Somewhere, everything I'd been waiting for since I was a lonely little sixteen year old, locked away in bedroom listening to Yentl and the Broadway Album and slowly coming to terms with my sexuality became real—she totally delivered, and I haven't stopped smiling since. If you were willing and able to pay between £100 - £600 for a ticket, then the concert to end all concerts would've been yours to see. Live Earth? No. George Michael? No way! Barbra Streisand was in town in case you didn't hear. Babs performed 3 nights at the newly-renovated 02 Arena to near sell out crowds on a stage shaped like a square figure 8 and with a 58-piece orchestra. Ms. Streisand opened the show with "Starting here, Starting Now" and had the crowd in the palm of her hand from the beginning. Her every word, gesture, facial expression, note sung, every flick of her hair and every lick of her lips, Barbra had the mostly older crowd on the edge of their seats the whole time. Looking extremely younger then her 65 years, Barbra took the crowd through a repetroire of songs, most of which were songs from her early days. "The Way We Were" was the highlight of the evening as she seemed to stay away from some of her most powerful ballads, excluding songs from "Yentl", her hit album "Woman in Love" and songs from her dabble in disco in the late 1970's ("Enough is Enough" anyone?). Some of the older hits she did sing included "You Don't Bring Me Flowers" (without Neil Diamond) and "Somewhere." She also attempted to sing a song in French and answered pre-written questions from the audience. Joining Barbra on stage was a male quartet, four men from Broadway who dueted with her on a couple songs, including Evergreen, with Streisand beginning to sing in Spanish and segueing to English while the male quartet continued singing in Spanish, and another duet was the theme from the movie "The Mirror Has Two Faces"—"I Finally Found Someone." Barbra raphsodized about life in general on the stage, how proud she is of her son Jason (dedicating "Children Will Listen" to him). She also gushed about her husband James Brolin and wished him a Happy Birthday at the first concert on July 18th. Programs were £25 and t-shirts and other memorabilia were at prices more than at what you would find at other concerts, but no matter, it was Barbra Streisand on that stage, the voice was like butter and it was worth every pound.